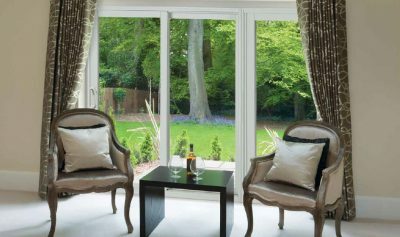 The Victorian Patio Door is manufactured from the most advanced vinyl technology. Victorian’s patio doors utilize a high-grade resin recipe unmatched for strength and wear. 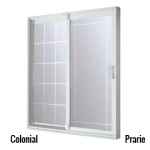 Offering beauty and performance, our patio doors will not rot, rust, pit or blister. Our multi-chambered, all-vinyl frame is durable and easy to install. 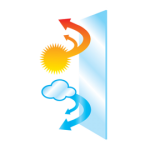 Maximized strength withstands high winds and provides superior air tightness. 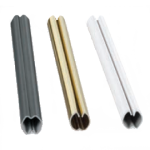 Internal grills are available in a wide range of styles and colours including flat grills (two-tone, white, brass and pewter), Georgian grills (white) and pencil grills (white, brass and pewter). 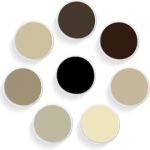 DEL windows boast a wide range of colour options that are impact resistant and feature a superior adhesion process offering a stable UV finish. Enhancing the outstanding thermal efficiency is the high-performance glazing found in Cardinal® Low-E glass and Edgetech Super Spacer® technology. Upgrade to this unique handle with integrated single-point keylocks (available in white, black, brass, black nickel, satin nickel or bright chrome). This heavy duty locking system provides two locking points on the door frame (optional on all hardware handles). Compliment the decor in your home with the warmth of a wood grain look. 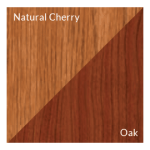 State-of-the-art laminating innovations allow for the beautiful appearance of wood grain for any interior application. Guardian Locks mount at the top of the operating door. 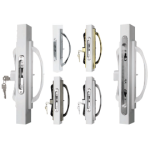 The security bolt is engaged and lock into the top door frame (available in white, beige or brown). Folding Security Bars mount on the fixed side of the door frame. When the security bar is swung down into the locked position, the door cannot be opened. Two Position Kick Locks mount on the bottom of the operating door. It is used as secondary lock with door in the closed position. (available in white, beige or brown). Decorative and elegant glass designs.